1. Heat a large, heavy-based frying pan over a medium-low heat. Butter both sides of each slice of bread. Mix the grated cheeses together and use to top 4 of the slices. 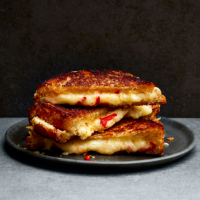 Scatter over the chilli and position the remaining slices on top to make 4 sandwiches. Press down firmly to compact the cheese. 2. Add as many sandwiches as will fit to the pan, cover with baking parchment and use a heavy pan to weigh them down. Fry for 4-5 minutes on each side until crispy and golden, and the cheese has melted. Cut the sandwiches in half, then into 3 strips lengthways. Serve immediately. This recipe was first published in Thu Oct 25 16:11:40 BST 2018.